Powerful Nigerian governor Rotimi Amaechi and four of his northern counterparts have been pelted with stones by opponents in his home state. Their convoy was attacked as it left the airport of Port Harcourt, the capital of his oil-rich Rivers state. The northern governors were visiting to show their support for Mr Amaechi. 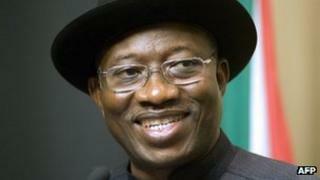 He was suspended from the ruling party for what analysts see as his opposition to President Goodluck Jonathan. The governors of Nigeria's 36 states are extremely influential and have large budgets at their disposal - and can help determine the outcome of national polls. Mr Jonathan, from the southern state of Bayelsa, which neighbours Rivers, is expected to stand for re-election in 2015 on the People's Democratic Party ticket. Analysts say it is imperative for him to have the support of Rivers, which is Nigeria's wealthiest state. Chanting anti-Amaechi slogans, a crowd of about 300 people was at the airport when the northern governors arrived on Tuesday. Some of the protesters threw stones and other objects as the convoy left, shattering the windscreens of some of the vehicles, Nigeria's ThisDay newspaper reports. Since Mr Amaechi's suspension at the end of May, there have been political tensions in Rivers state, and moves to oust him as governor by factions alleged to be loyal to Mr Jonathan. Last week there were chaotic scenes in the local parliament as four anti-Amaechi MPs tried to take advantage of an empty chamber to impeach the speaker. When their plan was discovered, they were rounded on, and some were beaten and chased from the parliament building. There have also been accusations that the police have been acting against the governor, which the visiting northern governors said they deplored. The governors of Adamawa, Jigawa, Kano and Niger states said the state police commissioner should be redeployed and if not they threatened to stop funding the federal police. "Having interacted with our colleague and other persons, we are shocked at the role of the police in Rivers state and condemn its clear partisanship in the show of shame that took place at the Rivers State House of Assembly," they said in a statement, Nigeria's Daily Trust newspaper reports. "With the way the police is being used and abused... we do not see the need for state governments to fund an antagonistic police and may be forced to reconsider our position on the financial contribution of the states towards the funding of the Nigeria police." Before Mr Amaechi's PDP suspension, he had been re-elected as chairman of the governor's forum, but a rival disputed the outcome, declared himself chairman and the body remains split. The suspension was not related to the governors' forum vote, but over a local council issue in Rivers state.